Thank you, we know that every day you are inundated with more information than you could possibly take in. We just want to make it as simple as possible for you to return to your life without pain and enjoy your family and friends. Back In Motion has been serving Olympia for over 19 years and we would love the chance to serve you. One of the most important things in our office is to give you the best care possible without making it a burden on your bank account and your time. Our staff is here for you and we pride ourselves on providing excellent service that meets your needs, not ours. Chiropractic and massage therapy is at the center of our treatment. Walk-ins, are always welcome without the guilt and high pressure associated with many offices. 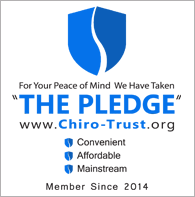 ChiroTrust® Dr. Don Soran D.C.